The two watercolor paintings are estimated to be created in the first decade of the 20th century when Adolf Hitler was in Vienna. An exhibition dubbed “Color, Canvas, Architecture” opened at Tehran’s Dafineh Art Gallery on October 5. 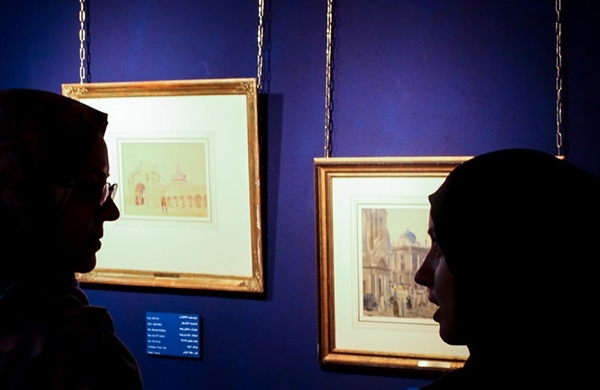 The event showcases 25 artworks by Iranian and foreign artists, among them two paintings by Adolf Hitler. The paintings on display are owned by a culture center affiliated with the museums arm of the Mostazafan Foundation. The standout items on display are two watercolor paintings by Adolf Hitler. The two paintings by the notorious dictator were created when he was in Vienna. According to the authentication certificates of the paintings, they are estimated to have been painted in the first decade of the 20th century. One of the paintings features a church along with a theater and the other shows a building which is probably an old university. Artworks by French painter Eugene Flandin, Sergei Kolesnikov, Mehdi Taeb, Esmail Ashtiani, Garcia Rodriguez, Yervand Nahapetian, Houshang Seyhoun and Atashzad are also on display at the expo.